Leroi Bredenkamp (65) excelled with the bat for Union Stars against Ramblers. 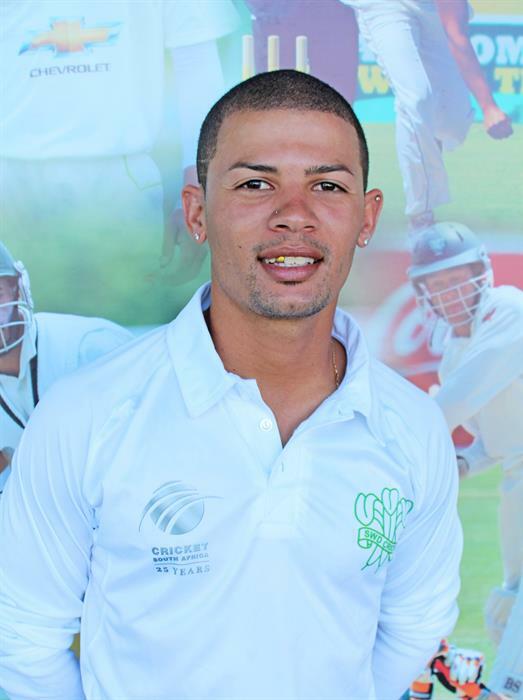 SOUTHERN CAPE CRICKET NEWS - Union Stars (186/9) are back at the top of the table after they recorded a 132-runs bonus point victory against Ramblers (52 all out) at the Bridgton Sports Ground last weekend. Leroi Bredenkamp (65) with the bat and Ayabonga Ngondo (4/5) with the ball excelled for the home team. Mossel Bay (125 all out) defeated Western Hope (115 all out) by 11 runs in a close contest at the Van Riebeeck Stadium and will keep their hopes alive for a place in the top three. Jaco Fourie (5/24) produced a match-winning bowling performance for George (100/8), who had to work very hard against a gutsy Pirates United (99 all out), winning by 2 wickets. Knysna Cavaliers, who posted 211/5 at Loerie Park thanks to an unbeaten century by AB van der Walt (103*), produced an impressive 139-runs victory against Pacaltdorp United, who only managed to respond with 72 (all out). MOSSEL BAY 126 all out (43,2) (Morné Jonker 49, Mauritz Pretorius 3/14, Jaco Windvogel 2/8, Damion Esau 2/13, Michael Hess 2/27). WESTERN HOPE 115 all out (44,2) (Damion Esau 28, Steve Lourens 22, Henk Lourens 2/21, Christo van Schalkwyk 2/22, Wiets van der Westhuizen 2/230. PIONEERS 99 all out (31,2) (Jaco Fourie 5/24, Grant Simpson 3/38). GEORGE 100/8 (31,4) (Gary Wagner 26, Eden Tarentaal 4/23, Claude Terblanche 2/29, Darryl Damons 2/29). UNION STARS 186/9 (50) (Leroi Bredenkamp 65, Elridge Booysen 40*, Gert Swart 3/32, Fabian Meyer 2/27, Colan Hoogbaard 2/53). RAMBLERS 52 all out (22,5) (Askin Louw 21, Ayabonga Ngondo 4/5, Anver Venter 2/10, Dillan Nuys 2/17). KNYSNA CAVALIERS 211/5 (50) (AB van der Walt 103*, Wayne Thompson 35, Sidwell Williams 4/34). PACALTSDORP UNITED 72 all out (31,4) (Jemaine Jeonna 21, Neville Mclean 2/0, Francois Bonthuys 2/8, Irvin Campher 2/16, AB van der Walt 2/24). MAYFLOWER 417/10 (46,4); KWANONQABA 55/10 (16,2). BLANCO 126/10 (34,4); SUSSEX 127/6 (28,3). NEW DAWN PARK 58/10 (16,3); HARTENBOS 59/3 (13,5). HEIDELBERG UNITED 169/10 (29,3); RIVERSDALE 51/10 (13). BEAUFORT WEST 92/10 (26); CALITZDORP YOUNG STARS 87/10 (25,2). BONGOLETHU 232/10 (41,2); MASAKHANE 100/10 (23,1). HARTENBOS B 180/10 (44,3); GEORGE C 184/5 (38,4). HARLEQUINS FORCES B 166/10 (37,3); WESTERN HOPE B 94/9 (34,4). Union Stars beat Harlequins Forces by an innings and 36 runs. HARLEQUINS FORCES 157/10 (37); UNION STARS 216/7 (40). THEMBALETHU 183/10; ST GEORGES 111/10. UNION STARS B 68/10 (23,1); SUSSEX B 71/2 (9,2). GEORGE C 184/10 (36,2); PIRATES UNITED 106/10 (23,2). PIONEERS B 170/10 (37,4); MOSSEL BAY C 126/10 (39,4). Union Stars C won MOSSEL BAY B by 5 wickets. MOSSEL BAY B 111/10 (32,1); UNION STARS C 114/5 (21,1). George B won Pacaltsdorp United B by 110 runs. GEORGE B 181/10 (36,2); PACALTSDORP UNITED B 71/10. Riversdale beat Dysselsdorp by an innings and 159 runs. DYSSELSDORP 13/8 (9,3); RIVERSDALE 181/3 (22).